It makes a lot of sense for a B&B to embrace energy efficiency with improvements to loft insulation, low energy light bulbs and using renewable energy sources if it's feasible. As well as cost savings in the long term, it's likely that the current focus on the state of the planet means that being able to tout your energy efficiency credentials will be a useful marketing point. There are a number of things that all houses, regardless of whether they are B&B's or not, can do to help energy saving. Draughtproofing, more insulation in lofts and around water tanks and pipes, replacing incandescent light bulbs with energy efficient ones, and simply turning off things that aren't in use are cost-effective measure that can transform the energy efficiency of a B&B. Taking it a step further, you could consider installing renewable energy systems such as wind turbines, solar panels or heat exchangers. Wind turbines are a hot topic at the moment but are really only worth considering if you are in an area of regular wind. 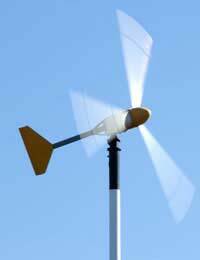 Otherwise the turbine has to be mounted high up on a supporting structure and that makes it a lot more expensive. There are also noise issues too, not that good for the guests in a B&B. Solar panels, despite the name, operate on light, not sun, so they do produce energy all year round, although it's less in the winter. There are two main types, those that are liquid filled and provide hot water for washing and central heating, and those with photovoltaic (PV) cells that convert the light into electrical energy. Heat exchangers are becoming more popular in the UK although still more for self-builders on an ecological mission than for mainstream house builders. A liquid filled coil of tubing is placed below the ground where the temperature is warm and virtually constant all year round. That heat is transferred into a central heating system and hot water cylinders. There are energy costs in the form of pumps to circulate the fluids but if that electricity comes from PV cells then the whole system can be a said to be from renewable sources of energy. If you do embrace renewable energy systems it is probably wise to remain connected to mains services because then you'll have a backup if your systems fail. It would not be that impressive for guests if you suddenly had to serve cold breakfasts in the dark and they were unable to shower after day out fell walking. One neat trick that's appeared in hotels worldwide over the last decade or so is to ask customers to hang up towels that they are happy to reuse and put the ones that want washing in the bath. This has halved towel washing costs for some hotels and at the same time it can be promoted as an energy saving initiative, so it's a true win-win situation. This could be a worthwhile idea for the eco-conscious B&B owner.